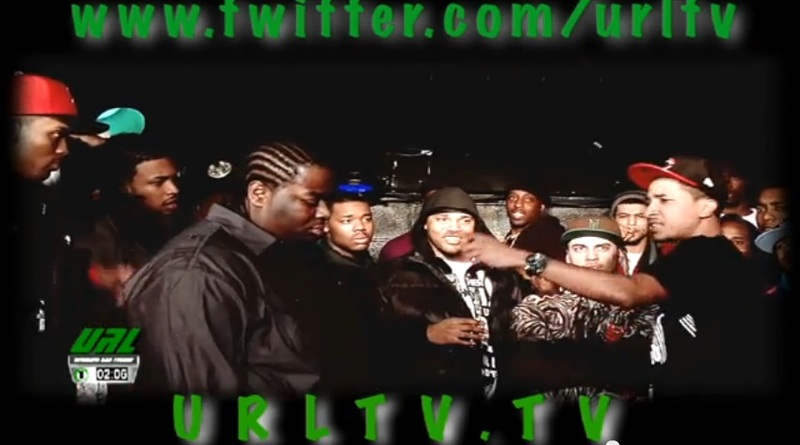 This is a classic matchup between Chicago, Illinois rapper Big T and Queens, New York rapper Hollow Da Don. This was a highly praised battle and one that boosted the popularity of both MC’s. Big T, who, by the looks of it, lives up to his name, comes out first with heavy hands and tough talk. He claims his opponent, Hollow Da Don, talks big game but can’t live up to it. Near the end of his first verse, he says, “Sound like somebody was playing too much Street Fighter.” It’s his strongest line, which Hollow quickly throws aside upon being given the chance: “I was playing Street Fighter all night long/For four hours and never picked Balrog,” pointing at the monstrosity to his left. Hollow gives Big T “everything from battered intestines to bladder infections.” The giant out of Chicago tries to look disaffected, though his hazy gaze ends up looking worried. The top YouTube comment says, “Big T probably still has nightmares about this battle.” Yup, it’s thorough. This entry was posted in Big T, Hollow Da Don, Smack/URL and tagged Battle Rap Lyrics, Big T, Big T vs Hollow Da Don Lyrics, classics, Hollow Da Don, Hollow Da Don vs Big T Lyrics, Rap Battle Lyrics, Smack, URLTV. Bookmark the permalink.